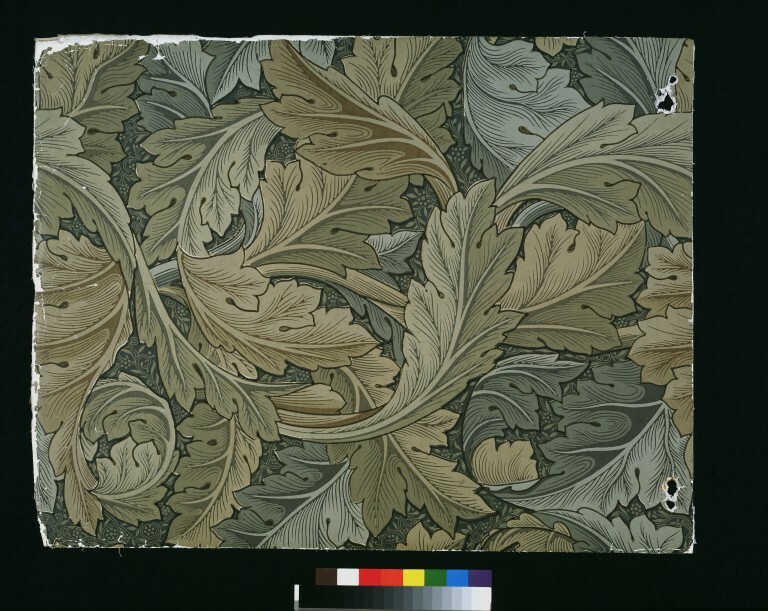 Specimen of 'Acanthus' wallpaper, foliate pattern of intertwined acanthus leaves in shades of green; Block-printed in distemper colours, on paper; Inscribed on the back in ink with title, number and price. Part of 'Volume 1', a pattern book containing 25 Morris & Co. patterns from 1862-81 (E.441-529-1919). The 'Acanthus' design requires thirty separate woodblocks to complete the pattern. 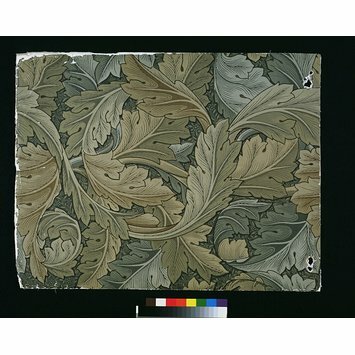 Specimen of 'Acanthus' wallpaper, foliate pattern of intertwined acanthus leaves in shades of green; Block-printed in distemper colours, on paper; William Morris; Part of 'Volume 1', a pattern book containing 25 Morris & Co. patterns from 1862-81 (E.441-529-1919); England; 1875. Saunders, Gill. Wallpaper in Interior Decoration. V&A Publications. London. 2002. pp. 114. pl 97.